King Neptune Statue. King Neptune himself wants to be the subject of your photo! Take a selfie in front of this 7-foot tall mythological god of the sea to help you remember your Cape Charles getaway. Kiptopeke State Park. Between the hiking trails, the birds, the fishing pier and the boat ramp, there’s an abundance of subjects for you to fix your camera on. The natural world of Cape Charles is just waiting to be captured on film (or digital camera, if that’s more your style). Cape Charles Boat Tour. Choose a Sunset and Dolphin Search Tour, a Day on the Boat Tour, or a Barrier Island Tour, and you’re guaranteed a whole bunch of wonderful photo opportunities! The Eastern Shore of Virginia makes a fantastic photography subject, and there’s no better way to see it than from the shoreline with the bay waters carrying you along. Our front porch! There’s no better place to take a keepsake photo than from our front porch on your next visit to Bay Haven Inn of Cape Charles. Click here to book your room now. 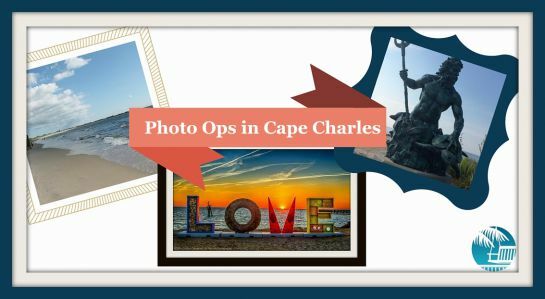 If you do take and enjoy some photos during your Cape Charles getaway, we’d love to see them! Please feel free to share them on our Facebook page, and they just might be featured in one of our future posts.